Want to try pomegranate homemade ice cream recipes? It’s easy to do right at home! Make some yourself with freshly squeezed juice from a pomegranate fruit or purchase some bottled juice from the local grocery store along with a few other ingredients and you’ll be enjoying ice cream made from pomegranates at the end of your favorite meal. The zesty taste of the pomegranate fruit shines through when you use 100% juice to make your ice cream. Top your favorite chocolate brownie or chocolate cake with this tangy ice cream. It has such a wonderful flavor. You can eat this ice cream made with pomegranate juice without any guilt whatsoever too because you’re eating powerful antioxidants, vitamins, and minerals (those come from the pomegranate)! Grab some pomegranate juice or some fresh fruits if they are in season where you live and take a chance – make some deliciously zesty and creamy ice cream. You’ll love these recipes! Melt bittersweet chocolate, add whip cream and stir. Take champagne glasses. Put some pomegranate seeds on the bottom. Top with scoops of vanilla, chocolate ice cream, strawberry ice cream sprinkle with pomegranate seeds, almond, cashews and chocolate syrup. Make juice from the pomegranate and lemon lime (save some pomegranate seeds for garnish) and pour them together into a bowl. You'll need about a cup in half of pomegranate juice. Add the powdered sugar and mix to dissolve. Beat in the whipping cream and keep beating until in becomes firm. Place the ice cream into a plastic container cover tightly. Place into a freezer for at least four hours or overnight. To serve, let the ice cream soften for a few minutes, then put into bowls sprinkle with pomegranate seeds and enjoy. Mix together the whip cream, sugar and vanilla sugar until its firm. Mix in the pomegranate juice and salt. Add the mixture to an ice cream maker and freeze according to the manufacturer's directions. Take out vanilla ice cream from freezer to slightly defrost. Blend well pomegranate juice, strawberries and sugar in a food processor. Add the ice cream and continue blending until mixture is smooth. Serve with pomegranate seeds and pomegranate syrup as toppings. 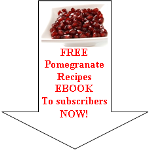 Read enough about pomegranate homemade ice cream recipes and want to discover more pomegranate recipes?